Last week we didn't do a very good job sticking to our menu. Days don't always go as planned and we had to make some adjustments so there are a couple repeats on this weeks menu that we didn't get to last week. Monday: Buffalo Wild Wings with my cousin. It's one of my favorite chain restaurants and they're opening one at the bottom of our street. I've been waiting 6 months for it to open, so we're going for opening night! I need to check out your eggplant pasta, I am trying a zucchini lasagna this week. 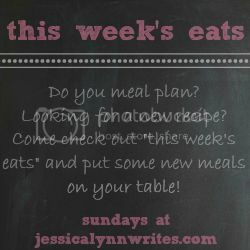 This is my first week in a long time in trying out a weekly meal plan again and I was excited to see there is a link up! Yay! I'm jealous over how good your week looks! BWW (YUM! ), souvlaki is delicious (as are pitas), and I looooove quesadillas! thanks for linking up! Oh, how I love Pad Thai! I've never attempted it before, though, so thanks for the recipe link.